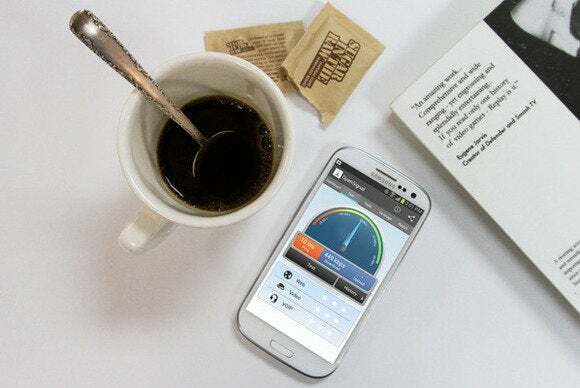 In this year’s wireless speed tests, TechHive and its testing partner OpenSignal focused on getting real-world results. That’s why we used ordinary, readily available smartphones and tested in the physical spaces where real people use such devices, both inside and outside buildings. Drive test metrics are great to have, and they help mobile carriers improve service and target problem areas on their networks. 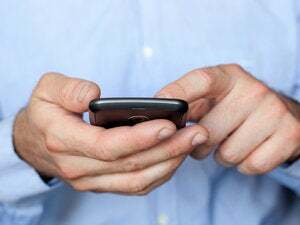 However, with over 34 percent of households in the United States claiming a mobile phone as their only phone, we know that most smartphone users are either at home or at work, presumably somewhere inside a building. In our tests, outdoor service was usually better than indoor service, but not by much. Both 4G and 3G service suffered an average speed loss of less than 0.7 megabits per second (700 kilobits per second), but that small difference turned into a big one for services where download speeds were less than 1 mbps to begin with. Overall, 3G service showed marginal speed decreases when we used it indoors. Sprint, T-Mobile, and Verizon 3G speeds degraded by 5 to 9 percent in indoor usage. 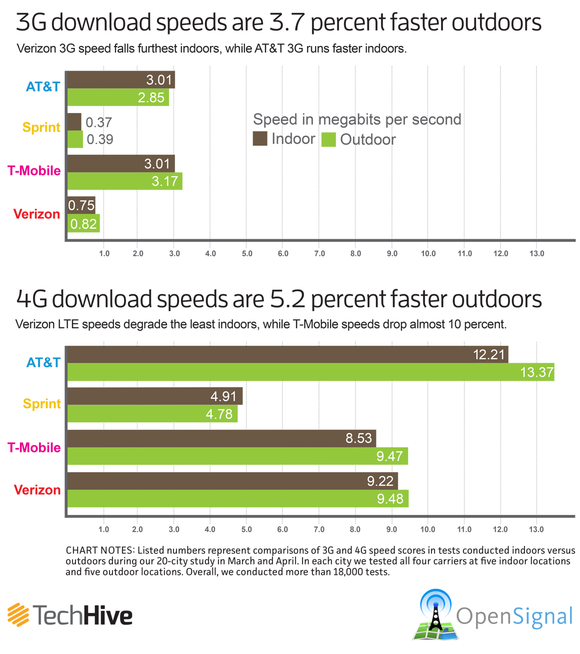 AT&T was an anomaly: Its 3G service produced download speeds that were 5.28 percent faster indoors than outdoors. We saw more-pronounced differences when testing LTE service indoors and out. AT&T’s and T-Mobile’s respective LTE services worked much better outdoors, with speed advantages of 9.5 percent and 11 percent, effectively. Verizon LTE also worked better outside, but by only 2.8 percent. Sprint is the outlier here, as its new LTE service currently works slightly better indoors. In general, though, users with LTE service will get far better indoor signal strength. Current 4G service, specifically LTE service at 700MHz (which most carriers use), penetrates buildings better because of its relatively lower frequency. What you won’t notice is an improvement in voice service, as that (for the moment) relies on 3G, even when you’re using a 4G phone. For the most part, cellular signals are just like any other radio waves—and just like AM/FM, they are susceptible to a number of external factors. The type of connection, the initial strength of the network, the surrounding building types and materials, and the general topography all conspire to make your connection worse or better. We’ve found that large downtown areas generally have plenty of signal strength, but at ground level all those big buildings can get in the way, especially when you’re using 3G service. However, if you are lucky enough to be farther up in a big building—as we were in a few of the testing locations in Ann Arbor, Atlanta, Boston, Kansas City, and Washington D.C.—you may be both vertically far enough away from some of the structural interference and closer to a rooftop tower that improves your signal. Thick concrete buildings and heavy brick architecture invariably make things worse. Signal deterioration can increase twelvefold when you move from a wood-frame structure to a concrete-block building. Pierpont Commons at the University of Michigan in Ann Arbor was a standout among difficult indoor signals due in part to heavy brick building materials coupled with a lower-than-average outdoor rating. It may boast two pianos and a food court, but the University Union building doesn’t have much in the way of mobile signal, even at a table near the window. To be fair to the University of Michigan, we were surveying large areas, and our building choices were sometimes arbitrary. Nevertheless, it’s reasonable to expect a mobile-proof building like Pierpont Commons in most areas. Here’s hoping it isn’t your house or office. One other important indoor/outdoor difference we noticed during testing was in the physical hardware of the devices we used. Our testing was limited to the Samsung Galaxy Note II and iPhone 4S, so we can’t make a wide comparison, but both screens were extraordinarily difficult to see in direct sunlight. And the iPhones we used (not to mention my iPad) frequently produced an emergency temperature warning if they weren’t in the shade. The iPhones did seem to absorb the heat more readily than the Note IIs, especially in their metal bezel frame. We’d love to hear about your own indoor-versus-outdoor wireless experiences. Let us know in the comments! This story, "Is 3G/4G slower indoors? Not as much as you might think" was originally published by TechHive.